I’ve been getting Knitting Daily in my inbox telling me that NOW is the time to start holiday knitting, along with patterns for hats, scarves, and other smallish items. I can probably knock out a decent hat or scarf in a few days, but if I want a festive holiday sweater, now is the time to start. I saw this on a female model on the back cover of a Vogue Knitting magazine. It looked oversized and casual on her. 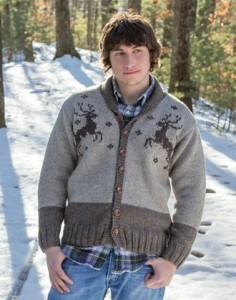 I love the natural colored yarn, the shawl collar, and of course the chunky deer motifs. The colorblocking is interesting too, it makes the sweater look shorter than it is. Fur trimmed hood! And certainly faux fur, sparkly eyelash, or mohair would also work. The fair isle motifs could be modified to be more obviously holiday themed, and several people on Ravelry have posted pictures of this with long sleeves. Plus, it zips! I love zippers. These remind me of a vintage ski sweaters. The short sleeves make the upper one, I think, quite chic. The color palette could be changed around easily enough. The ski sweater with pompoms has some neat lacework, and I can see some possibilities with those pompoms. I can see this not being everyone’s cup of tea with a bow at the bust line, but it is festive, and I love the funnel neck instead of a turtleneck, which always make me feel like a little stifled. The cranberry color is great, and would work for other festive occasions, like anniversaries or Valentine’s Day. I love this top. It’s texturally interesting, and a great layering piece. I’m a beginning crocheter, so this would be challenging for me, but I think it’s stunning. Cables, bobbles, and loops, but still elegant. I love this cardigan, and it looks fun to knit. If I were to do it for a holiday sweater, I would pick a different color, with some sparkle in the trimmings. I’m imagining this in green with red trim. I think with the sophisticated pattern it would avoid being kitschy even in traditional “Christmas colors”. 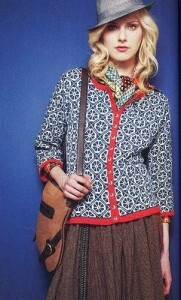 I love that short-sleeved fairisle sweater from 09 Holiday vogue. It has been in my Ravelry queue since Holiday ’09. Perhaps Holiday ’14 ’tis the season for that sweater?